Online Booking Coupons are a great way to attract new guests, encourage repeat guests, increase referrals, and fill up slow seasonal periods. 40% Vacation Rental Desk users offer this type of coupon for their rentals. The average coupon amount ranges from $99-200. Over 50% of all coupons created on Vacation Rental Desk use a percentage discount, and they usually fall between 10-25%. 6% of users implement this type of coupon, but it has the potential to be highly effective if used to fill a minimum stay requirement. 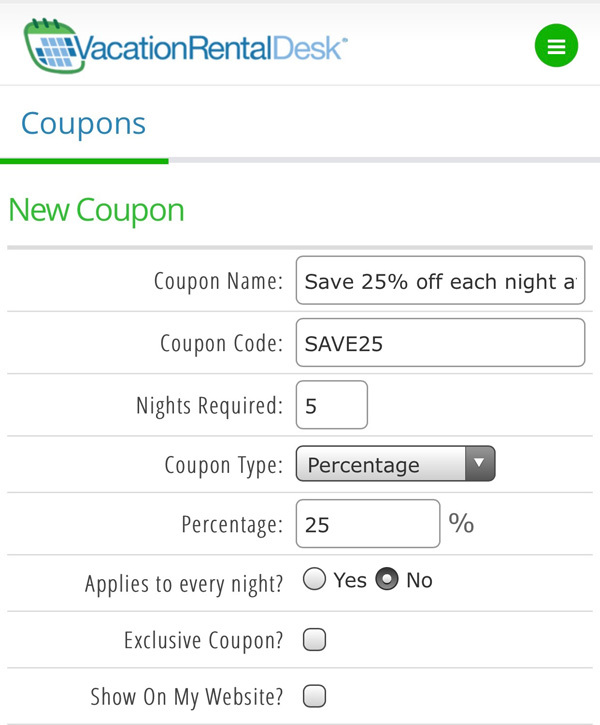 Booking Coupons for your vacation rental work the same way as other coupons do online at stores: Guests simply enter a code while booking online to get an instant discount at check-out. Restrictions can be placed on Booking Coupons, including expiration dates and valid date intervals (for promoting seasonal periods). Sign-in to your account, click the "Settings Tab", click "Coupons" and then click "Create New Coupon". Fill in the coupon name, the redeemable code (a 4-10 digit code with no spaces), and the other coupon requirements as shown below. Set the expiration date or valid date interval if desired. Advertise the coupon through social media, your website&apos;s blog, email, direct mailing, magazines, newspapers, and flyers. There&apos;s no limit to how and where you can promote your coupons! Ready to get started? Our vacation rental website builder will get you up and running quickly and effortlessly. To learn more about our vacation rental websites and software please feel free to ask! Or call us direct at (949) 391-2682 and we would be happy to speak with you to see how Vacation Rental Desk can benefit your vacation rental business. VacationRentalDesk.com is a user-friendly online booking and reservation management solution for do it yourself vacation rental owners and managers. Our vacation rental website builder will get you up and running with an availability calendar and secure online booking in just minutes.